Bomber combat crews faced a wide array of perils as they flew over German territory. Bursts of heavy flak could tear the wings from their planes in a split second. Flaming bullets from German fighter planes could explode their fuel tanks, cut their oxygen supplies, destroy their engines. Thousands of young men were shot, blown up, or thrown from their planes five miles above the earth; and even those who returned faced the subtler dangers of ice and fog as they tried to land their battered aircraft back home. The winter of 1944 was the most dangerous time to be a combat airman in RAF Bomber Command. The chances of surviving a tour were as low as one in five, and morale had finally hit rock bottom. In this comprehensive history of the air war that year, Kevin Wilson describes the most dangerous period of the Battle of Berlin, and the unparalleled losses over Magdeburg, Leipzig and Nuremberg. 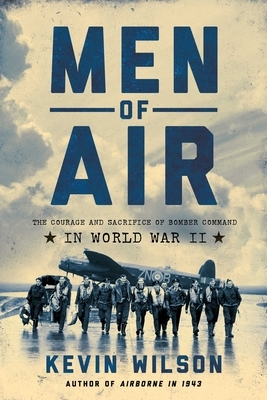 Men of Air reveals how these ordinary men coped with the extraordinary pressure of flying, the loss of their colleagues, and the threat of death or capture. Brilliantly placing these stories within the context of The Great Escape, D-Day, the defeat of the V1 menace, and more, Wilson shows how the sheer grit and determination of these "Men of Air" finally turned the tide against the Germans.